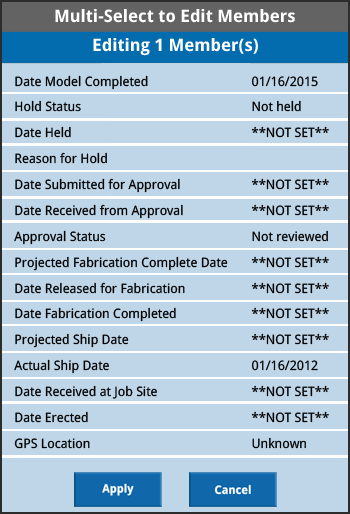 SDS/2 Mobile Status allows users to update information by input or barcode scans, and includes information like approval, fabrication, shipping and erection statuses from individual members to entire sequences or even the whole project. SDS/2 Mobile works on any Android phone or tablet. Multiple members can be edited for review or to update status information. From the Job Completion Status screen, tap on any of the categories to access the list of members within that category. To access all members, click on your phone's menu button; tap View All Members, which opens a list of all members in the job, sorted by sequence and then by member type. Click the Menu button on the phone again and then tap Enable Selection Mode; tap to select each member that is to be edited. When finished selecting members, tap Edit Selected to access the multi-edit screen. While in the multi-edit screen, if multiple values are specified for certain statuses, **MULTIPLE VALUES** will be displayed. These can, however, still be changed if required. When all changes that are required are made, tap Apply Changes at the bottom of the screen to save the changes.